This is the first part of a two-part piece. Here we will learn the basic theories behind AED and how it can help increase the survival rates of victims of sudden cardiac arrest. AED or Automated External Defibrillator is a portable device that is used in the emergency management of sudden cardiac arrest. Basically, it is used to ‘reset’ the heart by sending calculated electric shocks to the heart through the chest wall (also known as defibrillation). An AED is equipped with a built-in system that automatically assesses the condition of the patient, particularly the heart rhythm. Based on the heart rhythm of the patient, the AED decides whether defibrillation is needed, and then sends the electric shock. It comes with simple audio and visual commands, making the process simple even for lay responders. 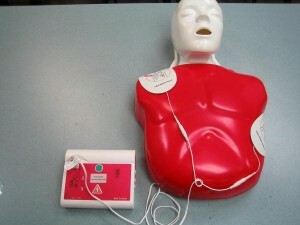 Most first aid and basic life support (BLS) training courses include sessions on how to use AEDs. The AED uses adhesive electrodes that are attached over the chest wall of the victim. These electrodes collect data about the electrical impulse of the heart (heart rhythm). The microprocessor inside the AED interprets the data and advises whether defibrillation is necessary. Shock is only delivered if there is fast ventricular tachycardia or ventricular fibrillation. The electric shock is delivered via the adhesive electrode pads through the victim’s chest. AEDs are an essential part of the Chain of Survival, especially in victims of sudden cardiac arrest. Immediate and proper use of AEDs can help restore a normal heart rhythm in victims. These portable AEDs empower the community to respond appropriately in medical emergencies that require defibrillation. According to statistics, the chances of survival for victims of sudden cardiac arrest decreases by up to 10% for every minute that elapses without defibrillation. AEDs are truly lifesaving. In general, most AEDs are intended for lay responders or non-medical personnel who have completed first aid and basic life support courses. These include flight attendants, security guards, police, company emergency staff, and other trained first aiders. Having more people in the community who are trained in basic life support and using AEDs will greatly increase the survival rates in victims of cardiac arrest. This is a picture of a basic AED with pads placed in the rear. Almost all AED’s have two simple buttons. One to turn it on and the other to shock. Sudden cardiac arrest is a fatal medical emergency and is one of the leading causes of deaths in the country. It can happen any time and to anyone, regardless of age. Cardiac arrest occurs when the heart suddenly stops beating and pumping blood through the body. This results in the loss of brain functions and immediate loss of consciousness. Contrary to what many people think, cardiac arrest and heart attack are not the same. A heart attack or myocardial infarction is caused by the blockage of an artery that supplies blood to the heart, resulting in chest pain. However, some people who experience heart attacks may also suffer from cardiac arrest. How does an AED help victims of cardiac arrest? During cardiac arrest, the heart frequently goes into ventricular fibrillation or ventricular tachycardia (sudden, uncoordinated electrical activity in the heart). This results in abnormal heart contractions that ineffectively pump blood out of the heart. The portable defibrillator administers electric current to the heart muscles, stunning it for a moment, and stopping all electrical activity. This ‘resets’ the heart, giving it an opportunity to resume normal heart rhythm. I went to pick up my son from Dudley Middle School today and noticed a coeltclion for the school to purchase an AED machine in the main office. It astonished me that such a basic piece of equipment is unavailable in a school. I would have thought that it woud be manditory. I am also disappointed that this would not have been considered a priority long before now! Even more surprising was the appathy and sentiments of it costs money and cutbacks expressed when I inquired why this would even be an issue. It was almost as if the possibility of even saving one life wouldn’t be worth it due to the expense . You don’t have to be a health care provider such as I to appreciate the serious consequences incurred less this be corrected.